Learn how to make the best bbq sauce recipes. What are the best recipes? This discussion goes on all the time especially among the barbeque fanatics. I must say I have had this discussion many times myself. Like most things it is just a matter of opinion. Let me back up just a little to the word “barbeque”. What does this word mean? I have had this discussion quite often also; especially with my nephew, Mike. Mike use to live in Florida and he loves the barbeque there; it is made without sauce. You have a choice of sauces to choose from and you can add as much as you like. In Ohio, where we both call home, all barbeque had to be cooked very slowly and lathered with sauce and once it was cooked that was the sauce you got. Now some say that if you cook without the sauce it is not barbeque; it is simply grilling. Everyone has an opinion and especially if they think they have learned how to make the best bbq sauce recipes. The first sauce which comes to my mind and many others is open pit barbeque sauce recipes. (Kind of reminds me of the old fashioned apple butter process). 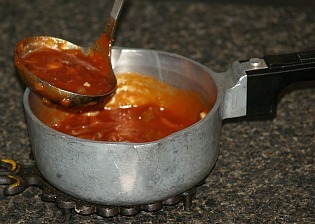 The cooking of barbeque sauce over an open flame in a large open pot until it is very thick draws in a flavor that cannot be gotten any other way. Many of these recipes which have been passed on have been reinvented through the decades. To most, the words “open pit barbeque sauce” is referring to the commercially made brand by Kraft which appeared around 1950’s. So do you think you have learned how to make the best bbq sauce recipes? For the basics of barbeque sauce, consider the flavor spin that the sauce will give to the food which you are grilling and how much of the sauce will you be using on the food. Too much sauce and too much flavor will overwhelm the taste of the meat or seafood. If there is a high degree of pungent ingredients in the sauce you will want to brush lightly on foods like mild fish and chicken. For heavier meats like beef and pork you can get away with using more spice and applying it more liberally. This is one of the easiest and best bbq sauce recipes when cooking for a crowd. Use with 30 pounds pork or beef ribs or with rump roasts. Place meat in the oven for 20 minutes to brown. Combine all ingredients (Except meat) in a large container and blend. Pour the sauce mixture over the meat; cover tightly. REDUCE HEAT TO 300F degrees; bake for 4 to 5 hours or until meat begins to fall apart. Serves 50; great with potato salad, slaw and dessert. During the last 10 to 15 minutes of grilling brush generously with sauce. Combine all ingredients and blend well; brush on ribs last 10 to 15 minutes of cooking. Combine all ingredients in saucepan and bring to a boil; simmer 10 minutes. Makes enough for 6 to 8 pounds ribs.